I don’t usually share House rituals, but I’m moved to share our New Year’s Eve ritual. This is one that many of us will be doing in our own homes as the year turns. I share it with you here, for those who may be wishing for some idea of what type of ritual to do, but who might be coming up short. This New Year’s, my cultus deorum practice took the lead with defining the ritual. Take a ritual bath to prepare yourself and dress in clean clothing. I. Begin by cleaning all your shrines, both to the Gods and the ancestors. II. Make an offering to your ancestors, thanking them for all their help and protection in the previous year and asking for their continued blessings. III. Make an equal offering to the house spirits. IV. If you have a mask, don it now and take up a noise-maker (drum, rattle, even a can filled with some coins) and open a couple of windows. Go through every room in the house making as much noise as you can, cleansing it via sound of any stagnant or unhelpful or malignant energy. Sweep your house, every room if possible and sweet out the door. Then vacuum. (I’m practical. My mother was Swiss lol). Take off the mask and put away the noisemaker. V. Light four candles and ask the blessing of fire on your home. VI. Go to the front door. wipe it, the threshold , and the lintels down with an infusion of juniper or verbena, or some other sweet and cleansing herb (I think Florida water is a good substitute). Hang colored streamers from your door (colored wool would have been traditional), anoint the hinges with a dab of olive oil. Asperse the door three times with verbena water, florida water, rose water or some other sweet smelling infusion. the wily one with mischief and wisdom in his heart. and whose eyes survey all that transpires in heaven. and interprets their will for mankind. (The image here is Forculus and LImentius by G. Palmer). Aphrodite whose soft, warm flesh delighted him so. accomplish? If so I am ignorant of it. Without your leave no blessings may flow. and close that which has been opened. with an abundance of all good things. Gracious Guardian of the door. in the year now past. and causes unexpected things to occur. no obstacle blocks their path. and bring helpful spirits through to aid us in our work. to all the temples of the gods. like the Nile in flood season. so that Demeter’s rich bounty can fill the land. and reach the ears of the Blessed Immortals. *anything else you feel moved to give. Hang a wreath on the door and ask for the Gods’ protection (if you have hawthorn, this is particularly associated with Cardea and is very protective. Laurel would have also been traditional for these wreaths but don’t sweat it). Say: “joy to this house” three times. VII. Go back inside and give an offering of grain and salt or salt and bread to the fire. VIII. eat something sweet, symbolic of welcoming sweetness in the new year. X. When you are next out, give food to the poor/homeless/hungry. I’ve been thinking a lot about sacrifice lately. Yule is approaching and that is a time where I often give appropriate sacrifices to Odin and it’s time to start thinking about what the winter will entail, and to start making the necessary preparations should animal sacrifice be part of that. I take the necessity and goodness of sacrifice for granted but obviously not everyone does. I recently had an issue with a neighbor over my practice. She didn’t see anything (I’m not rude to my neighbors and I have a secluded area and shed in which I do this type of work), but simply knowing that this was part of my practice bothered her extensively, to the point of her lightly interfering and interrupting a non-sacrificial religious rite. It’s easy when surrounded only by people who share one’s worldview, to forget how disconnected our society is from its food cycles, from offertory traditions, from life and death, and from the ways of our ancestors. Think about, people don’t die in the home anymore. They get shipped off to hospitals and hospice to make that passage which denies us contact with them in their last days, and with the process surrounding their dying, something, I might add, that I believe ratchets up the grief afterwards. Unlike with our ancestors, we buy our food neatly pasteurized, sanitized, sterilized, geneticized (yes, i’m making up a word? ) and sealed. There are kids today that don’t know hamburgers come from cows. Disconnection seems at times too mild a word. I get really passionate about this subject too. I’m passionate about a lot of things, but fiercely so where sacrifice is concerned, partly because I believe it’s incredibly dangerous and unhelpful to carry unexamined modern attitudes into our practice, and partly because sacrifice is so, so important. I’m really glad that it’s come up recently in discussion again, because it is a much needed impetus for me to write more about this. We talk much about restoring our ancestral traditions but this particular tradition can make some of us cringe: without butchery, i.e. the slaughter of animals, there is no piety. There is no religion. There is no being in right relationship with one’s Gods. Pretty much, to one degree or another, across the board this was the accepted view of our ancestors, and of religious traditions that sustained their people for generations upon generations. Even Judaism, Islam, and some forms of Christianity allow for it in many cases. Our railing against the necessity of sacrifice is just one more way that we assume that we know better than our ancestors. It’s one more way that we assume the death of our traditions was some sort of moral ‘progress.’ It’s what my colleague Raven Kaldera, in our book “Northern Tradition for the Solitary Practitioner,” called “Urdummheit,” the idea that our ancestors were stupid. I have found over the past couple of years, that in some sections of modern polytheism, even the idea of giving appropriate offerings is problematic. After all, it does highlight that we and our feelings are not the central point of the religious equation, doesn’t it? When Sannion and I were on the air, discussing this (among other things) on our show Wyrd Ways Radio, we had an unexpected call in by a listener who told a fascinating story about Alexander the Great, which can be found here. If I could see our contemporary polytheisms nurture any attitude in its followers, it would be this: we cannot give too much to our Gods. But in a culture, permeated with Protestant values, the values that say “don’t waste that” (or if one is Heathen “Don’t give too much!! !” – as if one *could*) when one is about to lay out an offering of food or drink, as if giving tangibly to one’s Gods and ancestors is a waste, it’s no wonder that we think ourselves kinder and gentler and –let’s be honest–above offering an animal. We as a culture think ourselves better than our pious ancestors. (2) It’s an arrogance unthinkable to the ancient mind. Sacrifice is one of the holiest of offerings. It is the most solemn and sacred of all rituals. It renews, restores, nourishes in a way that no other offering can. Not every Deity requires this granted, but many, many do. The role of the sacrificial priest, one that I have fulfilled since 1995, is an awesome responsibility. One must learn the mechanics of slaughter adeptly, so that the animal in no ways suffers. One must develop (or have an assistant with this skill) the ability to communicate with and soothe the animal. It is important that the animal suffer neither pain nor terror. They are fulfilling a tremendously sacred role, the apex of what their own wyrd may be, and participating in this communicatory cycle in a way denied us as people. It is an act worthy of recognition, respect, and care. This type of priest must learn all the necessary prayers and purificatory rites required before, during, and after both for oneself and for the animal. It is necessary to develop a very strong connection with one’s ancestors and one’s lineage because the power released during a sacrifice is enormous and the broken threads of our traditions, imperfectly restored (if at all) may not be able to sustain the force of that which once would have nourished a living community. Not everyone is meant to be a sacrificial priest. It’s a specialist position. Even though, for instance, I’ve done this work for years, I still divine before each and every ritual involving sacrifice to make certain that I am cleared to serve in this capacity. Our ancestors had the option in many cases of going to a temple, purchasing an animal, and having the sacrifice done for them. One should not attempt a sacrifice without proper training and, for the first few rituals, oversight. There’s no room for error here. There’s no room either from a religious perspective or a compassionate one for getting it wrong. Ken Dowden, Religion and the Romans, Bristol Classics Press, 1992, p. 1. The impact of the Protestant work ethic on contemporary Polytheisms and the making of offerings is a topic I’m reserving for another post. More on sacrifice may be found here and here. See also a post I made earlier in the year on modernity and polytheism. If I know that I have a ritual coming up, about three days before the ritual, I start preparing. I’ll make sure that the shrine cloths, sacred statues, icons, etc. offering bowls and any other accouterments that I require are clean and in good working order. I’ll also make a list of what offerings I need to acquire and make sure I do that well before the day of the rite (except for flowers. Flowers I tend to buy the morning of a ritual in order to make sure that they are fresh). Once all that is done, I turn to getting myself into the right headspace. The whole point of avoiding miasma, (and taking care of it quickly when it occurs) is to avoid being in a state that isn’t conducive to the presence of the Gods. Miasma can impact our headspace, our attitude, our energy, our discernment and shift us ever so slightly (or depending on the level of miasma greatly) out of true. We avoid miasma to maintain the best relationship possible with our Holy Powers. When we can’t avoid miasma (and we can’t – it happens as natural side effect to certain things. (3)), it’s important to cleanse it quickly. So about three days before a ritual, I start taking care with what I read and watch on tv. I’m easily affected by what I take in visually. Under normal circumstances I read and watch what I want (within reason. I don’t want to pollute my mind so I tend to avoid exposing myself to certain things, particularly things that are really really violent. I don’t want the images in my brain) but since I know that I can be affected by media, I’ll limit myself for a couple days approaching ritual. This helps me to get into and maintain a good headspace for approaching the Gods. I clean my house and make sure I have clean clothes for the ritual. All energetic cleaning begins first with physical cleaning, at least insofar as I was taught. So I’ll take cleansing baths for three days approaching the ritual. 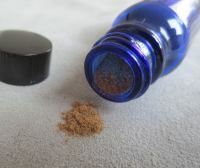 While I take regular cleansing baths anyway, usually with white salt or pink Himalayan salt (I find that different salts tend to be more or less intense in their esoteric cleansing properties) before a ritual, I’ll use black lava salt (which I find very strong). Sometimes I’ll also take beer baths – pouring a bottle of dark beer into my bath. It’s a German folk custom that really works like a charm (no pun intended) for cleansing or do some other type of cleansing bath recipe. I don’t isolate myself during this time. I go about my normal day, work, school, art classes, whatever needs to be done, but I try to do so mindfully. When I get home, I take a bit more care than normal over what I watch or read. I aim to eat healthily and get enough sleep (not doing the latter is one of my migraine triggers and I don’t want to get sick the day of a ritual). I also increase prayers and personal offerings to whatever Deity or Deities for Whom we’re doing the ritual. I may also read Their stories and prayers to Them if I have any. The day of a ritual, I get up early and set up the altar for the ritual. I go get flowers and whatever last minute items I decide I need and then I sequester myself for a little bit. I take a cleansing bath, dress in clean clothes (usually, if it doesn’t violate any of my taboos, in colors significant to the Deity or Deities involved). Then I take a half hour or so to ground and center myself, pray, and get into proper ritual headspace. Before the ritual begins, I’ll cleanse myself (usually with mugwort recaning or a fire blessing if it’s a Heathen rite, khernips if it’s cultus deorum) and partake of the rite. The only unusual thing that I sometimes find myself doing is covering my head in the days leading up to the rite, and especially the day of – all the more so if it’s a heavy ancestor rite. I find this helps my focus. Afterwards, I usually have to have time by myself again. I find the transition out of ritual space and back into regular quotidian space difficult sometimes. I’ll often take a cleansing bath again almost immediately afterwards, wrap up in soft, warm, and comfy clothes (the rattier the better LOl, you know, the ones you wear all the time) and get something to eat and drink. For regular daily veneration and devotional work, I am not at all as diligent. I’ll usually lay out all my preparations (offerings, etc. ), do a ritual cleansing (often just head and hands), meditate for a time, and then get on with things. But it depends. I do tend to avoid television, computer, and other media for an hour or so before any type of devotional work. There’s nothing inherently wrong with these things, but doing so helps me get into the appropriate focus. Of course if I do anything to put myself in significant miasma (and this can happen during good and right things. For instance, when I visit a cemetery and make offerings I’m doing right by the dead, but because I’ve entered a place of the dead, I’m in a state of miasma. I need to do a special cleansing when I return), then I do special cleansings (and I’ll divine if I don’t know what the best type of cleansing to do might be). Otherwise, this is pretty much it. The only other thing that I do is divination before the rituals to see if anything special is required, and afterwards to make sure all offerings were accepted. I also have divination done for myself quarterly to make sure I’m not missing anything in my devotional life. So I hope that answers my reader’s question. Feel free to shoot me any further questions if you have them, and let me know what you all do. I’d be very interesting in learning new ways to handle miasma and pollution. I use the term miasma for spiritual pollution. It is a neutral term (i.e. miasma is not sin, it doesn’t mean you’re a bad person, etc.) but it is Hellenic. Most of our traditions have some concept of purification but I find the term ‘miasma’ to be the most comprehensive (granted, this may be due to familiarity given my training as a Classicist). I would very much encourage people to see what the working terminology is or might be (we might have to do some linguistic research) within your own traditions. I plan to do this as soon as I have a spare moment with Heathenry. We know that pre-Christians Heathens had these concepts of purity and pollution (why sanctify a space with fire if it is already clean? Likewise, we have alternate names for two of our creator Gods (Vili, and Ve) that speak to inherent holiness and integrity. These are concepts that point in some way to the idea of miasma/pollution. We’re not as blessed as the Hellenics and cultus deorum folks out there in having a plethora of surviving material written by Heathens—a significant portion of our lore was written after conversion and little of it deals with religious praxis—but we can still infer a great deal from what we do have extant. Of course, purification isn’t something to worry about only when we are about to do a ritual. It’s important on a day by day too, for spiritual, emotional, and even physical health and well being. This doesn’t mean we’re bad or tainted, but it does mean that we’re miasmic and need to do the requisite cleansings. There has been quite a bit of discussion about miasma of late. I’ve seen discussion threads and articles and posts cropping up all over the place. Unfortunately it seems that many of the people writing on the topic lack the faintest idea of what miasma actually is. The idea of miasma and spiritual pollution is absolutely crucial to our practices. It’s important therefore not to stretch the meaning to fit some political agenda, not to misidentify and mis-equate one thing with another, and not to transfer monotheistic ideas of sin and shame onto these pre-Christian religious terms. It’s important to understand precisely what we’re talking about, why it’s so important, and how best to put it into practice. So let’s start with what miasma actually is. Miasma is spiritual pollution. I’ve written on it before here, and here and here. Likewise I wrote about the Roman idea of ‘nefas,’ which is somewhat analogous to ‘miasma’ here. (I think that the biggest difference between the two is that nefas has a definite and very negative charge, whereas miasma is neutral. Even positive things can carry miasma as we shall see). I think that while these pieces have been a good starting point to the discussion for me personally, my understanding of the topic has deepened and become far more nuanced over the years. “The basic sense of the ‘mia—‘ words is that of defilement, the impairment of a thing’s form or integrity.” (Parker, p.3). This is crucial information right here: miasma is about integrity. It is a twisting of things out of true. If we think of it as some impairment to the integrity of a person, place, or thing, then that can help us move away from thinking about miasma as ‘sin.’ One does not have to do anything wrong to fall into a state of deep pollution. It is the natural side effect of certain experiences. For instance, if I spend an extended amount of time in the company of people who are themselves in some way polluted spiritually, then I may also end up miasmic. Why? Because miasma is a spiritual contagion; just like dirt or germs, it is easily passed from one person to another. If I am in lengthy company of someone miasmic, I may find myself influenced by their words, ideas, and actions. I may start behaving, thinking, or approaching the Gods similarly. Without ever meaning to, my spiritual integrity may be corrupted. Drama is not a necessary component to this at all. What is necessary is attention to what we absorb, to whom we pattern ourselves after, and to the influences in our immediate social world. I’ve had the same thing happen with watching certain movies. I felt spiritually polluted afterwards. It was the same when I witnessed an act of verbal blasphemy during a ritual. I, everyone there, and the space itself were polluted simply by having been present when such a thing occurred. This clearly points to how one positions oneself in their world. How do you carry yourself, behave on a day to day. How are you situated with respect to your neighbors? All of these things combined to create what we might term ‘character.’ Part of good character to our polytheistic forebears involved piety. Of course, as my friend L. pointed out, the roiling energies of community drama can create situations that may lead to miasma but so can a wedding. Seriously, amongst the list of things that put one in a state of spiritual pollution are weddings. These are happy things, the union of two families, a building block for one’s community and its longevity but (like birth and death) they create imbalance. They create pollution. There’s nothing bad at all about them, but they still put those present in a state of miasma. Some situations just do that. We may feel perfectly fine. We may even feel happy (for instance at one’s own wedding) or celebratory but we are no longer in a state of spiritual attunement. Why is miasma so crucial? Its effects are long term. It’s not like the Gods are going to smack one down for being in a miasmic state after all, but it corrodes and compromises one in one’s relationship with Them. It impairs signal clarity and a lot of times the consequences of it aren’t immediately noticed, in fact, may not be felt at all until suddenly the spiritual relationships that were once so vital and present and true are blurry, distant, and hard to reach. It impairs luck and health. It twists all that is spiritually balanced and good, beneficial and ordered into something plebeian, mundane, and gross. It lowers us in the eyes of the Gods and part of the reason that people may not recognize when they are in this state, or approaching it, is that our world is so out of balance. Our world is riddled with spiritual pollution on every level. In a society where people are blowing up mountain tops from sheer greed, poisoning our food supplies, where children are picking through mountains of garbage for food, and the Kardashians are considered role models it’s difficult for people to recognize such spiritual disease. When once piety and purification were the expected adult norm, now it’s the exact opposite and people look askance, even in our communities, when one seeks to take proper precautions around one’s spiritual health by insisting on healthy boundaries. Not only do we need more conversations about this, we need to take more action, especially when we’re doing group rituals and gatherings. For those wondering, would I still have read the book knowing all of this beforehand? Yes, absolutely but I would have gone in with my eyes open and would have prepared myself better and immediately cleansed afterwards. Two further comments on this that I’d like to offer: 1. This is where divination can be extremely helpful, if one is uncertain of whether a particular person, place, or thing might be polluted and 2. What to exclude, whom to avoid are not decisions that can be made for an individual by anyone else. What is miasmic to me, may not be to my husband and vice versa for instance. We serve different gods, have different levels of purification expected of us. What to allow into one’s world and whom to associate with are decisions that each person must make for themselves after careful consideration and perhaps prayer and divination. I was thinking about Mani tonight and it inspired me to hunt up this example of a nice Monday night ritual that can be done for Him. For Heathens and Norse Pagans, the moon Deity is male. He is a glorious, gentle, and deeply compelling God named Mani, the son of Time, nephew of Night, brother to the Sun and the Cosmos. He rides across the fabric of night, followed by the wolf Hati, who, it is said, either keeps Him on His course, or chases Him with the intent of devouring Him and bringing on Ragnarok. Only Mani knows the truth of the matter, and perhaps, the wolf. What is attested to in the surviving sources, and in the experience of those devoted to Him, is how deeply Mani cares for humanity, especially children. Some say that it is for this reason that the wolf must follow Him, for otherwise He might easily be swayed off His course out of curiosity or caring for those humans who scurry about beneath the waxing and waning of the orb He bears. Today is Mani’s day. Monday actually means “moon-day” and in our tradition the moon belongs to a lovely God named Mani. Monday is His day and a good day to make offerings to Him. I try to do a little something for Him every Monday. Sometimes I forget–i’m human and I make mistakes. My mindfulness occasionally has its lapses–but I do my best to be as consistent as possible. Fortunately, even when I slip up, Monday will always come round again. I like to give Him little things whenever i can. Usually, I make my offerings in the evening, because I like to do so when the moon is visible in the night sky. Sometimes though ,He rides high and proud, winking at us from the lightening hues wrought by His sister’s passage and for me, there’s a special delight in that and then I will honor Him when I rise, making my offerings with the brightening day. Offerings like this need not be enormous. I usually give Him a glass of either sambuca or, more recently, Smirnoff’s marshmallow flavored vodka. He seems to like it. I spend a few moments in prayer and that’s that until the next Monday. It’s a stabilizing consistency to the crazy roller coaster of my life. Some of you might find it strange that we honor a moon God and not a Goddess (our Sun Deity is a Sun Goddess as well –and Mani’s sister– to complete the juxtaposition) but we are not unique in this: Japanese and Egyptian religions also have moon Gods and if i went looking, I suspect there are a few more as well, but I’m feeling lazy today so I’ll leave that research to you, my readers.. One wonders though if all the moon Gods are companions…. When my adopted mom was small she used to call the moon Luna Lunera and would watch as She (my mom of course as a small child thought the moon female) showered the earth with the blessings of her gentle light. She said her father would stand on a balcony of their home while she played in the garden –oh she must have been very small—and throw candies down and she thought they came from the moon. Maybe, in a way, they did. I never thought about it one way or another until I encountered Mani and then I knew what it was to love the moon. He is beautiful and compelling in His ways. Even I am not immune, though it amuses many and probably Mani too should He ever catch wind of it. Begin by setting up a small altar to Him. It need not be elaborate, but should include a candle and incense burner with incense. Moon images and anything else associated with the moon are quite appropriate. Many of us have found that Mani likes beaded necklaces, jangles, time pieces, even bits of clock and watch innards, abacuses, calendars, night blooming flowers, and music. Anything of this ilk, and anything else that one personally feels called to associate with or give to Him is appropriate to place on the altar. You should also have something to offer Him: a glass of alcohol, cookies, flowers….anything that you are moved to give. (If you are including your children in this ritual, have them help you prepare the altar). Once you have created the altar, which is, in effect, an invocation in and of itself, sit quietly for a few moments centering yourself. This may easily be accomplished by a simple exercise that I call the ‘four-fold breath:’ inhale four counts, hold four counts, exhale four counts, hold four counts. Then repeat for five minutes continually. Hail to the God of the Moon. and Sweet Darkness in the light. Son of Time, be with me here tonight. Turn Your gentle gaze in my direction. Wash me in the sweet caress of Your light. especially for the grace of my day. I know each day is a gift. and thank you for watching over me each night. By Your grace, may I never lose my awareness of Your blessings. Ride swiftly across the darkness, Sweet God of the Moon. May You always outpace the wolf who nips at Your heels. I hail You Mani with gratitude. I hail You with love. Hail best loved son of Mundilfari. Please accept these offerings, Mani. (Set out any offerings that you wish to give to Him. This can be as simple as a single glass of alcohol, or a cookie). Spend a few moments in contemplation. As you sit in silence, imagine that with each breath you are drinking in the presence and blessings of the moon. With each inhalation you are inhaling Mani’s soothing, healing light. Feel or imagine that this light flows through you cleansing away all stress and tension, and any miasma you may have picked up throughout your day. Continue for as long as you like praying or meditating upon the blessings of the Moon. Thank you, Mani, for holding me in Your light. May my comings and goings on this day be pleasing to You. The rite is now completed. You can either allow the candle to burn down, or save it for your next Mani ritual. I usually find it best to leave the altar out for awhile, but there is nothing amiss if you must, of necessity, deconstruct it right after the rite. I think that this ritual is best done before bed, but this is a very personal matter. Some people are simply more alert in the morning. Being a night owl, I tend to prefer doing all my ritual work late in the day or early evening. Use your own judgment in this. Do this rite whenever you feel you can best connect to Mani. (In each of the rituals for the days of the week, I provide a small section of similar suggestions. These suggestions have been drawn from my own experience with the God or Goddess in question, and discussions with many others who honor Him. They are suggestions and you should not feel limited by them. If you want to offer something not on this list, or feel a strong association go with it). Symbols: anything moon shaped, hour glasses, old watches, clocks, and their component parts, knots, calendars, musical scores, flutes, beads, mirrors, mathematical equations, abacuses and other time keepers, astrolabes and other nautical equipment for plotting directions. Stones: moonstone, labradorite, selenite, quartz, and amethyst. Flowers: Camellias, jasmine, night blooming flowers. Food and drink: sambuca, cookies (especially ones with marshmallows or odd shapes. A nice way to incorporate children into the above ritual, is to have them make moon shaped cookies in honor of Him), angel food cake, peppermint flavored sweets. Other offerings: any volunteer work or donations that benefit abused children or the mentally ill.
Contra-indicated: harming or abusing children in any way; mocking the mentally ill.
As we jumpstart the discussion of Heathenry and ritual, I’m seeing a lot of folks mistaking powerful rituals for those rituals that are elaborate, complicated, and “high church.” I want to note that a ritual can be very, very simple. The power comes from the focus and skill of the facilitator. The way I was trained, both in esoteric arts and in ritual, is this: if you can’t do it naked at two am in an empty room, then you can’t do it. What that means is that a good ritual worker develops a sensitivity to the presence of Other: Gods, spirits, ancestors. A ritual worker, if he or she is competent, develops a facility for demarcating and slipping into liminal space and back again succinctly and ultimately for leading others through that process as well. One becomes efficient at navigating the spaces and sense of the sacred. That need not include complicated praxis (though for many, such structure assists in the necessary cognitive transitions). While there are deities that are far more protocol heavy than others, in most cases, I’ve always thought that the complicated ritual structures were more for our benefit, to allow us to navigate the pathways of the sacred more safely, to assist in transitioning into and out of ritual headspace. There’s a point where you don’t need them. Unless the Deity in question has indicated (through tradition, divination or direct engagement) a preference for complex liturgy, I actually prefer hard, fast, and to the point. But I can slip into ritual headspace very fast — it’s one of the skills i’ve picked up per Odin over the years. For all that, the simplest of ritual should still involve a palpable shift from mundane headspace to liminal, ritual headspace, should involve a palpable sense of Presence, should effect a shift in the participants, should require transition back to mundane space. There’s a process inherent in a good ritual, no matter how simple. The most important thing is that the Gods are at the center of it, engaging with Them the purpose, and the collective intent focused on just that aim. Dver is offering some amazing incense! Oh. My. Gods. I used it this past week in ritual and it was lush and magical and just marvelous to use. I used it in offering to my dead, but it would make a lovely ritual incense as well. Anyway, I’m picky and I like it, so I’m recommending it here. ^_^.